Horizontal Carousel systems do not have to be elaborate and loaded with software. Most people think of complex systems when they think of horizontal carousels. They do not have to be. Horizontal carousels are exceptional pieces of equipment. They bring product to the person, saving time, steps, and touches. 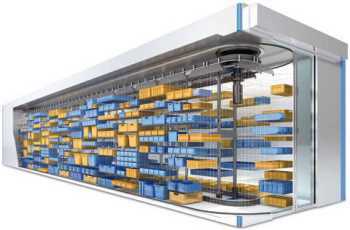 Horizontal carousels can have an exceptional ROI by increasing throughput, reducing required labor, and saving space. They can be operated with a simple run / stop or with software that will setup the next pick to an order and display pick location and the quantity to pick. We can assist you in achieving your product / bin to person goals. Keep it simple or let the software do the thinking. CSI provides horizontal carousels for bringing product to the person in picking, kitting, and putting operations. We also offer Vertical Carousels, Vertical Lift Modules, Stretch Wrappers, Strappers, Mezzanines, and Shelving.